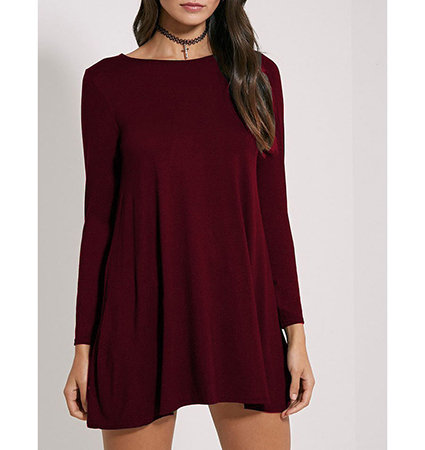 This women’s mini dress is a perfect cool weather dress that is designed simply enough to be dressed up or down according to which accessories are worn with it. It comes in your choice of fern green or burgundy. It features a simple, round neckline and has long fitted sleeves. It is cut in a modified swing style and fits loosely through the body. It has a long, concealed zipper in back that lies perfectly flat. This dress is machine washable in warm water and is available for purchase in sizes Small, Medium, Large and Extra Large.